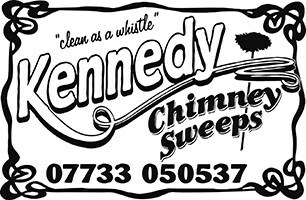 Kennedy Chimney Sweeps are a well established family team that have built up an enviable reputation in the sweeping business. We pride ourselves on our commitment to providing a professional and punctual service at all times, whilst maintaining the highest quality of work in a demanding environment. We have years of knowledge in the industry, effective problem solving and attention to detail is our forte. Finn and Nick are proud members of NCSSA and both trained with the Institute of Chimney Sweeps. Nick is also a member of SweepSafe and a Hetas Approved Chimney Sweep. Our website shows some indication of the strange things we find in our day to day work, we usually only take photographs of the problems we find, many flues are just fine and don’t make it onto these pages www.burwashsweep.co.uk. Our goal is to meet and exceed the expectations of every customer. We take on all types of jobs from the smallest domestic stoves and open fires to larger commercial projects, all carried out to the highest standards and at very competitive prices. As sweeps we get called to clean, inspect and generally check the safety of many flues and appliances. These can range from stoves to inglenooks, oil boilers, solid fuel range cookers (AGA, Rayburn or Stanley), biomass, pizza ovens or school heating systems you just never know! We carry out CCTV inspections at varying levels. This takes away the guess work - it allows us to look for damage to flues, combustible materials and judge the internal diameter before fitting flexible liners. We also get called into inspect problem flues - appliances smoking back into the room, syphoning, damaged liners, chimney fires or poor installations to stoves with little or no draw. CCTV can help identify problems but the knowledge gained from experience is the main advantage. Stove maintenance is a big part of our work. We stock a large selection of stove spares, glass, heat paint, door rope and vermiculite bricks for various stoves. Keeping stoves burning safely is important for the welfare of your house and family.